AHS has a particular interest in the history, development and future management of historic Places of Worship. The earliest church where a Conservation Management Plan has been prepared by AHS is St. John’s Lutheran Church (formerly St. Andrew’s Presbyterian Church) built in 1842. St. Alipius Catholic Church, Ballarat East. 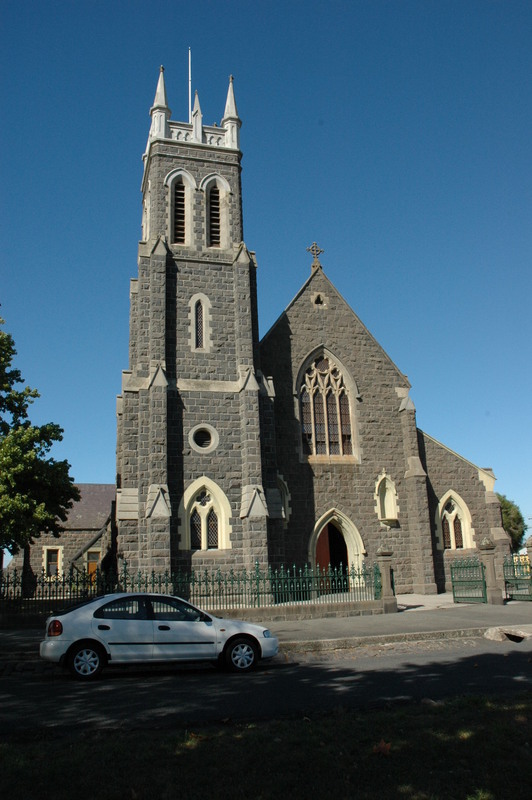 St. Alipius Catholic Church represents the earliest Catholic Church in Ballarat. The first open air Mass was celebrated by Father Patrick Dunne in October 1851, just two months after the discovery of gold. In November 1852, Father Dunne was replaced by Rev. Matthew Downing who became Ballarat’s first resident Catholic priest. He apparently made a claim on the first Mass site at Brown Hill, near where a large Catholic community camped. 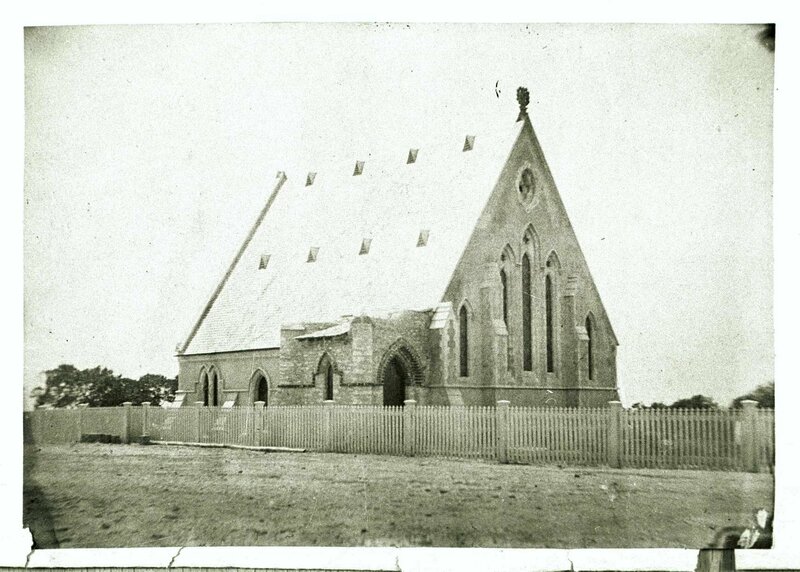 Downing’s first Church was built of slabs and canvas and roofed with bark stripped for him by the local Aborigines. In 1853, Downing relocated his Church to the existing site on a level piece of ground above the Specimen Vale Creek. The Church was enlarged and constructed in a more contextually pretentious manner on this new site. On 27 November 1853, this Church was consecrated by Bishop James Alipius Goold. It was Goold’s Augustinian religious name that Downing bestowed on his Church, becoming St. Alipius. The origins of the name are with St. Alipius, born in North Africa about 360, St. Alipius was a close friend of St. Augustine and became a Manichean. Ordained at Hippo, St. Alipius made a pilgrimage to Palestine before becoming Bishop of Tagaste in c.393. By mid 1854, Ballarat was a burgeoning canvas town, inhabited by a predominantly male population of gold diggers who were becoming increasingly discontented as a result of what they saw as Government injustice, intransigence and tyranny. St. Alipius Church played an important role in what become known as the Eureka conflict. Many diggers that participated in the stockade attended Mass in the Catholic Church. Matthew Downing’s successor, Father Patrick Smyth, was chosen as a delegate to present the diggers’ demands to Government officials. He also visited the diggers’ stockade and spoke to various diggers who were under the command of Peter Lalor. It was Smyth who apparently hid Lalor after the stockade in his tent where Lalor’s arm was amputated. A £500 reward had been issued by the Government for Lalor’s apprehension. 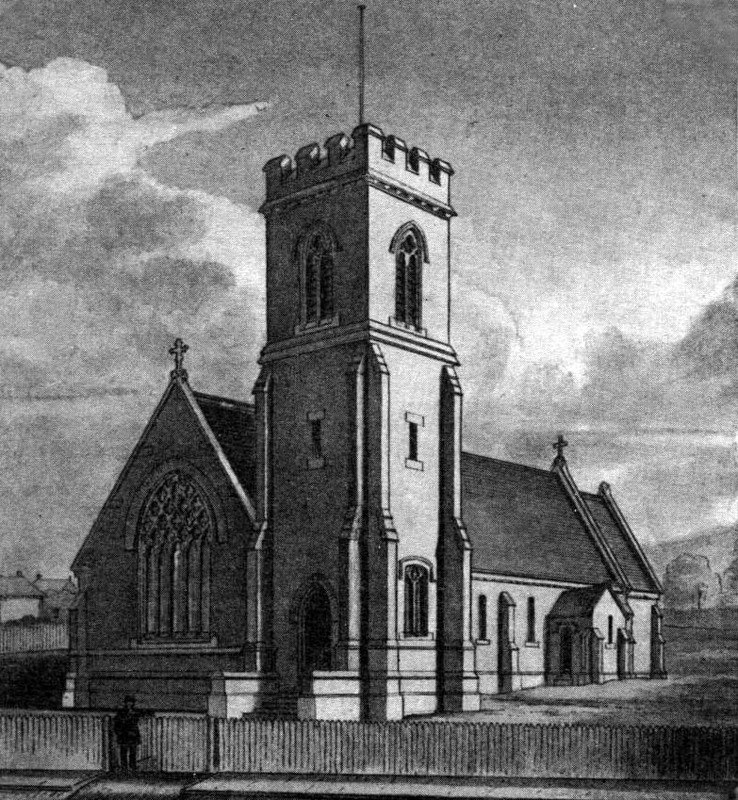 In 1856, further alterations were carried out to the Church. A transept was built by Rev Patrick Madden (Smyth’s successor) and with the arrival of the Rev. Dr. Sheil in 1857 came more substantial building improvements. This improvements included a bell from Langland’s foundry, Melbourne. In August 1872, the Rev. James Moore (later Bishop of Ballarat) proposed the construction of a new Church on the site of the existing building. Local architect, Henry Caselli and his assistant, W.B. Tappin, were awarded the commission. For the design, the architects were largely guided by one of five standard Church design types that had been prepared for Bishop James Goold years earlier by the eminent Gothic Revival English architect, Charles Hansom. On 2 March 1873, the foundation stone for the new building was laid by Bishop Goold. Opening in 1874, the building was only a partial realization of the original design, comprising a clerestoried nave of five bays, flanking aisles, projecting west porch, and temporary timber chancel. The original concept appears to have been for a seven-bayed nave, adorned with a tower. 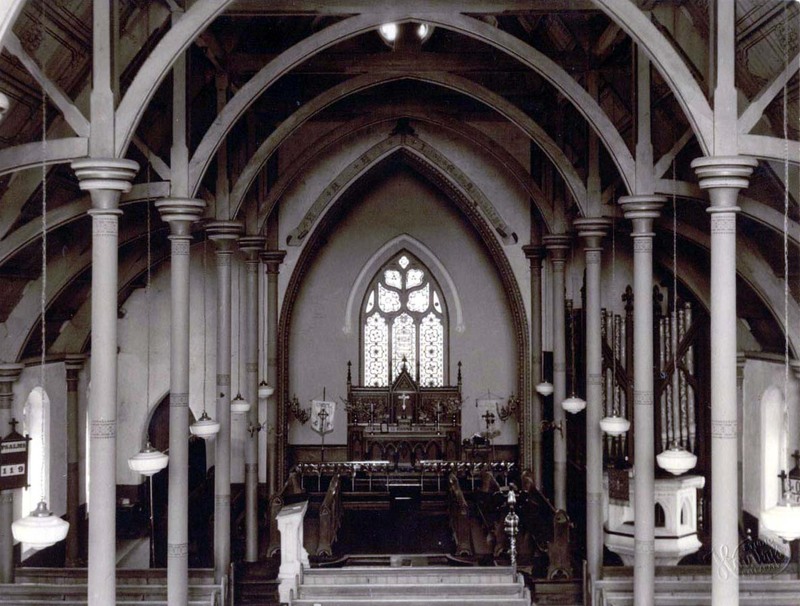 In c.1908, a choir gallery was constructed at the northern end of the nave. It was accessed by a cast iron spiral staircase in the north-east corner. By 1912, the gallery was adorned with a Fincham organ that was funded by Count Sir Thomas O’Loughlin, a Papel Knight of “Killarney” at Warrenheip, Victoria. It was in 1924 when the most profound alterations and additions to St. Alipius were carried out, apparently broadly reflecting the design concept first proposed by the architect, Henry Caselli. The construction of two additional bays to the nave and aisles, stone chancel and sacristies, and a landmark tower, were designed by the Melbourne architect, Augustus Andrew Fritsch and were constructed by the Lodge Brothers of Hamilton. It was also in 1924 when the Right Rev. D. Foley, Bishop of Ballarat, laid the foundation stone for the new work. A cast iron palisade fence, formerly of the Ballarat Base Hospital, was also introduced at this time. In the 1940s, further improvements were witnessed at St. Alipius. In 1944, a new marble altar was installed by the Rev. H. Gleeson. Three years later in 1947, a stained glass chancel window was introduced. Both the altar and the window were installed as memorials to the pioneers and deceased parishioners of Ballarat East. I n 1968, liturgical changes in the Catholic Church brought about changes to the altar and the installation of a front altar with the extension of the platform at the front of the nave. By 1979, further considerable changes were proposed. These alterations were designed by Bryan R. Dowling Pty Ltd, architects and planners, Canberra and Melbourne. These alterations included a further extension of the altar platform, removal of the top tier and spire of the rear altar, installation of a marble top and glass base to the front altar, construction of an entrance foyer at the north end of the nave (under the choir gallery), introduction of a concrete slab floor in the entrance foyer, addition of a plywood floor system on the timber floor and the refurbishment of the timber pews. St. George the Martyr Anglican Church, Queenscliff. 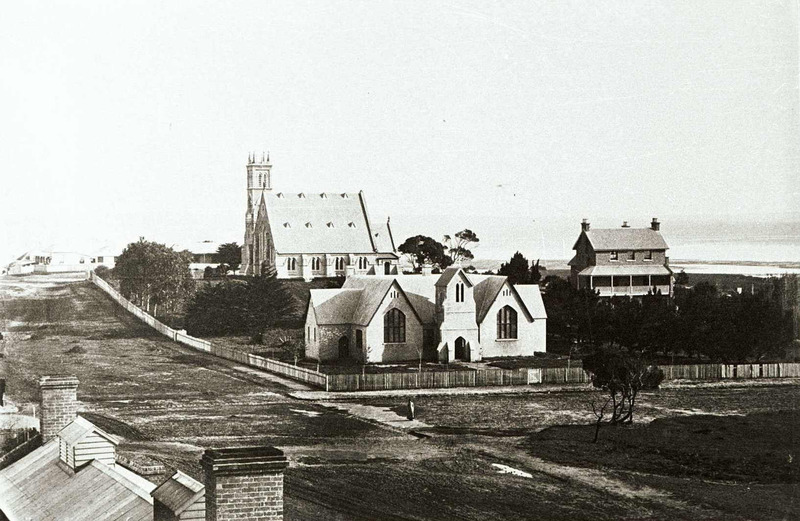 The seaside town of Queenscliff was surveyed in 1853. A year later in 1854, a timber Church of England school house ‘opened for the purposes of Divine service’ on 17 December. 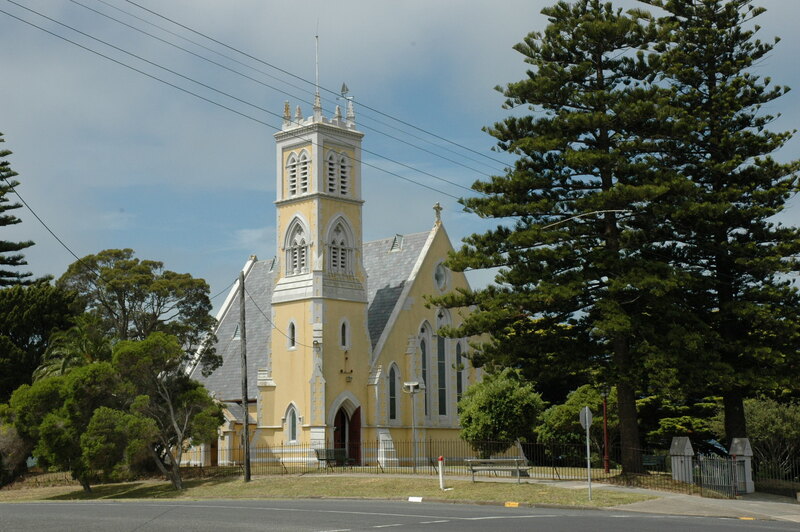 Approximately 2 acres of land in the Township of Queenscliff had been reserved for the Church of England. The St. George the Martyr Anglican Church was constructed in 1864 to a design by the Melbourne architect, Albert Purchas. The building was constructed in random rubble limestone with a stuccoed cement finish. 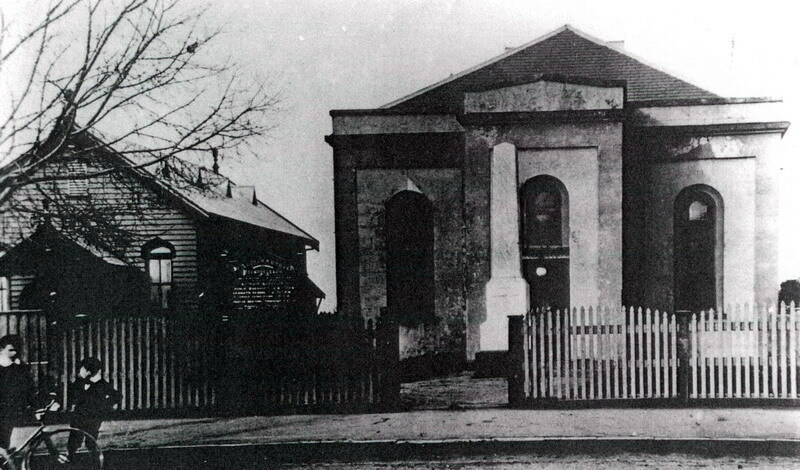 The first Church service was held in February 1864. A year later a large brick Vicarage was constructed to the north of the Church, with the Rev. Henry Wilkinson becoming the first resident minister at St. George the Martyr. In 1877-78 the landmark castellated tower was added in stuccoed brick and limestone, also to a design by Albert Purchas. The small west gable porch may also have been added at this time. Ten years later in 1887, the chancel was extended according to drawings by the Melbourne architects, Smith and Johnson. These works also involved the enlargement of the original chancel arch and relaying the original marble floor tiles. In 1871, the Hon. Thomas Fellows donated his parliamentary honorarium of ₤300 equally between the Prahran and the Queenscliff Common Schools. Fellows was a devout Anglican and a considerable benefactor to his local churches and schools in South Yarra and Queenscliff. In 1872, work commenced on the new brick Church of England School on lower ground on the Church site. With the completion of the new School (later known as the Parish Hall), the old school was offered for sale by tender. The Church and Parish Hall have been associated with a number of community groups since the 19th century. In 1876, Robert Jordon advertised that his Grammer School for day pupils was operating from the School hall. This school appears to have closed in 1902. From 1880, the School building (Hall) was rented to the Cosmopolitan Masonic Lodge. In later years of the 19th and early 20th centuries, the building was also used by the Loyal Orange Lodge No. 157. The Australian Natives Association was a long-term user of the School Hall. 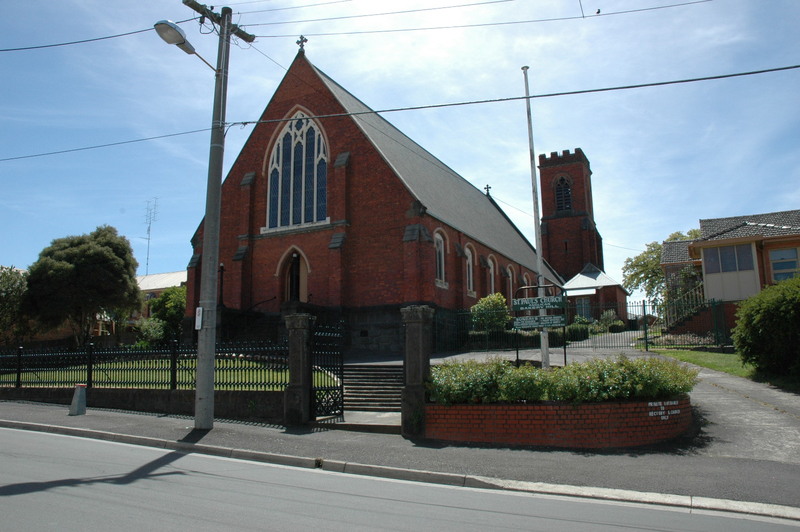 St. Paul’s Anglican Church, Ballarat East. Gold was discovered in Ballarat in September 1851 which brought about a rush of gold diggers. By mid 1854, Ballarat was a burgeoning canvas town, inhabited predominantly by a male population of gold diggers who became increasingly discontented as a result of perceived Government injustice, intransigence and tyranny. Bakery Hill (which includes the St. Paul’s Anglican Church site) was the location for mass meetings of gold diggers in the period leading up to the Eureka Stockade in December 1854. Prior to the Stockade, the Ballarat Reform League was created. Its charter demanded ‘full and fair representation, manhood suffrage, no property qualifications for members of the Legislative Council, payment of members and short duration of parliaments.’ After the Eureka Stockade and by 1856, the new Victorian Parliament had been established. It introduced manhood suffrage, vote by ballot, redistribution of electoral district and the abolition of the property qualification for members of the Legislative Assembly. Arguably, Bakery Hill was the crucible from which sprang democracy in Victoria. 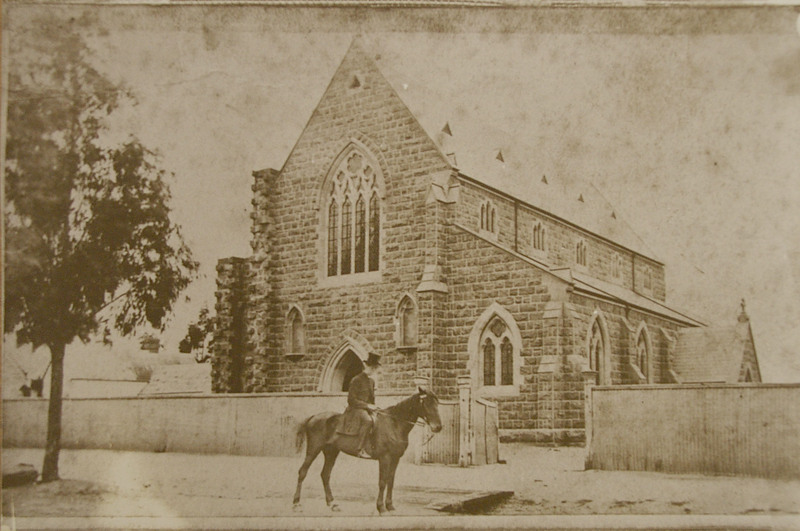 Soon after the discovery of gold in Ballarat in 1851, the first Anglican Church services were held at Golden Point (near the location of St. Paul’s Church) and at two other local locations. In 1854, an Anglican congregation had formed at Bakery Hill which became known as St. Paul’s, the first services being held in a tent. A Denominational School was first built in 1854, before St. Paul’s School Room and ‘Temporary’ Church were constructed in 1858. Extended in 1862 to a design by the prominent Diocesan Architect, Leonard Terry, the works included a chancel vestry, gallery in the west end of the nave and a massive square battlemented tower. 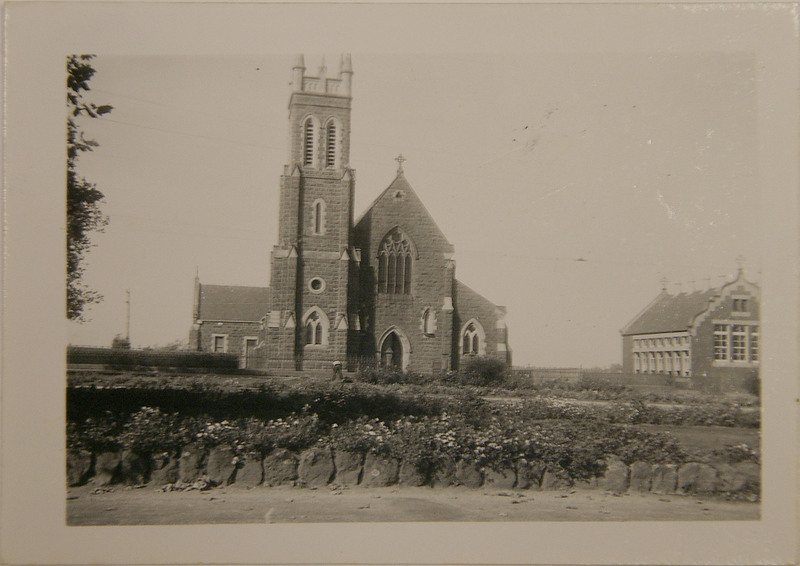 In 1864, the church was dismantled as a result of unstable foundations (due to a storm and the gold mining under the church that undermined its foundations) and a new brick church building was constructed in front of the massive tower, also to a design by Leonard Terry. The original timber columns that supported the nave of the original church, together with the original chancel window designed and manufactured by Ferguson and Urie (possibly one of their earliest surviving windows), appear to have been used in the new building.